Try a different tack this Valentine’s Day. Step away from tradition, and find an unusual way to surprise your Valentine. Surprise your beloved in original places and at original times to create a real wow effect! Valentine’s Day is about love. All types of love: for your sweetheart, for your brothers and sisters, but equally that warm feeling for the caring classroom assistants at school. Maybe you’ve been married for a decade, or you’ve just been on your second Tinder date. Love should be celebrated, however long or short your history together might be. And the thought really is more important than what you give, so keep it simple and make it fun. Wrapped up warm, you walk to the car ready for a normal Tuesday at the office. But what’s this? 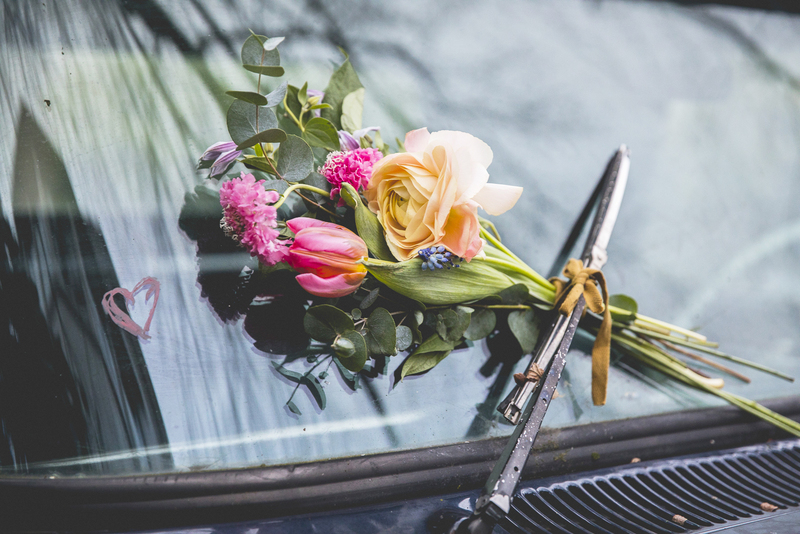 Are those flowers under the windscreen wiper? The accompanying message on the card leaves you beaming for the rest of the trip. What a delight! Flowers on wheels work well: transform their bike basket into a sea of flowers, stick tulips through the spokes of his fixie, and leave a bunch of flowers in the pannier of her big motorbike. Smiles guaranteed! On 14 February you don’t find your dinner’s been put in the oven - you find a beautiful bouquet in your set of Creuset pans. Fabulous orchids hang off the shower, you find mini-vases with your favourite flower in your desk drawer, and on your dresser there is a botanical wreath in your hair. With a bit of inspiration you can make the pop-up flowers appear throughout the day. The dog’s lead has a flower chain, you find rose petals with an unusual structure in your purse instead of coins, your bookmark has been replaced with a flower, and on your pillow you find a single flower. Valentine’s Day has never been so romantically unexpected.